Starz' move effectively kills an arrangement that Netflix called "one of our most important deals." NEW YORK (CNNMoney) -- Netflix's streaming content catalog is about to take a big hit: Starz said late Thursday that it has ended contract renewal negotiations and will pull its movies and TV shows from Netflix early next year. The move effectively kills an arrangement that Netflix (NFLX) earlier this year called "one of our most important deals" -- because it was was one of the few that gave Netflix streaming access to relatively recent films. Netflix stock fell almost 9%, to $212.39 per share, in early trading Friday morning following Starz' announcement. Netflix tried to downplay the effect the cancelled contract will have on its streaming catalog. "Starz content is now down to about 8% of domestic Netflix subscribers' viewing," the company said in a written statement. "We are confident we can take the money we had earmarked for Starz renewal next year, and spend it with other content providers to maintain or even improve the Netflix experience. Starz, a pay cable network, struck a four-year licensing deal with Netflix back in 2008. Because Starz has licensing deals with several major movie studies, Netflix was able to piggyback on the arrangements and beef up its catalog of recent releases. But in June, hundreds of Sony (SNE) movies -- including high-profile titles like "The Social Network" and "Salt" -- abruptly vanished from Netflix's "watch now" catalog. In a blog post, Netflix pinned the blame on a "temporary contract issue." The issue, according to the L.A. Times, was that Starz' deal with Sony included a cap on the number of subscribers who can watch Sony movies online. Once Netflix's audience exceeded the cap, the contract was null. Starz' catalog of Disney (DIS, Fortune 500) movies available for online streaming is on the verge of triggering a similar contractual cap, the newspaper reported. Netflix still has access to most of Starz' offerings, but its current deal with the network expires on Feb. 28, 2012. The two sides had been negotiating for months about an extension. Starz said Thursday that its decision to end the talks stems from "our strategy to protect the premium nature of our brand by preserving the appropriate pricing and packaging of our exclusive and highly valuable content." Translation: Starz wants more money. 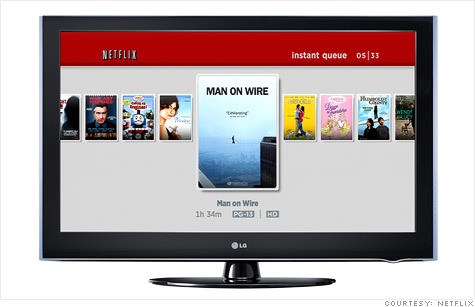 Now that streaming video is so popular, providers are upping the price for the content they're licensing to Netflix. One analyst predicts that Netflix's streaming content licensing costs will rise from $180 million in 2010 to a whopping $1.98 billion in 2012. But Starz' move hits at a particularly delicate time for Netflix, which is hiking its prices to offset those mounting content costs. Netflix said in July that it would begin charging separate prices for its DVDs-by-mail and streaming video plans, raising the cheapest-possible bill for customers who want both from $10 to $16 a month. Those price hikes kicked in on Thursday -- the same day Starz dropped its contract bombshell.